I must say that is pretty scary to me, but Idont like clowns and I never liked the laughing lady at Euclid Beach either...What is inside that anyways?? 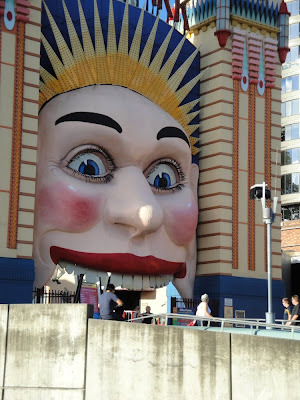 It's an amusement park inside Sydney. This is the entrance. At night the eyes and the teeth are lit up bright white. Australian kids must be fearless.